Le Conte du Graal, ou le roman de Perceval, the final romance of Chrétien de Troyes, presents a diagram of power that mirrors the one I have been attempting to sketch throughout this inquiry. Solely at the level of content, there is no process in which any character engages in this text that can be considered refolding or subjectivation. 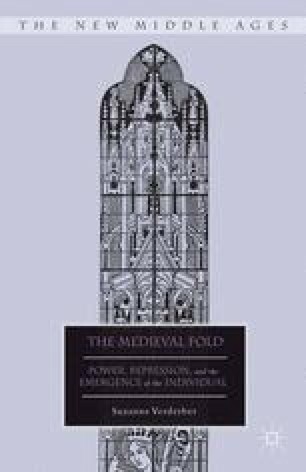 Both Perceval and Gawain (who takes over as protagonist when Perceval disappears from the story) are produced as subjects by forces from without, without inventing the means to redeploy force in relation to the self. As we saw in chapter 2, the troubadours did precisely this, misrecognizing power as Law, disavowing Law through the establishment of a masochistic contract with the courtly lady, and instigating a process of parthenogenetic becoming made possible by the lady’s gaze.We do not see this inventiveness in Perceval, at least at the level of character. The hero ends his days repenting for his sins, while his surrogate, Gawain, remains trapped in a mysterious castle run by hundreds of ladies, a bizarre multiplication of the fantasy of courtly love. This begs the question, why would an analysis of this text be included in an inquiry of twelfth-century strategies of subjectivation? One justification is that the text displays very clearly the dominant twelfth-century forces of subjection as they have been located thus far: pastoral power and Oedipalization. A second justification is founded on the proposal, to be developed in what follows, that writing in this text functions to produce a diagram of power that shows where possibilities of subjectivation, “ways out” of the power-knowledge matrix, might take place.